To end my two day mini-tour in Florence, I decided to visit the Boboli Gardens at Palazzo Pitti. I would recommend it to anyone who would like to find a peaceful place to draw, meditate and relax. Not to mention, the amazing view of the city that awaits for you when you walk all the way to the top of the gardens. I think my spring fever is on now... can't wait to garden. 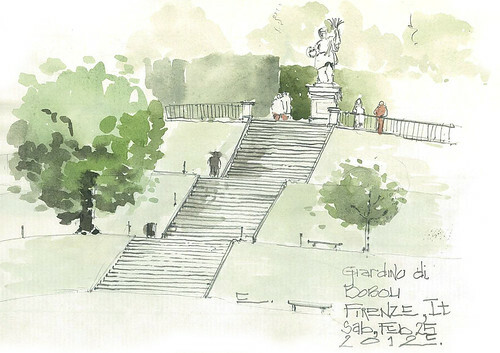 Love how you drew your travel in Florence, lucky you! I yet have to figure out a good way to draw outside... how to install, which mediums to take, etc. I'm also a little shy when people stops by and take a look at what I'm doing. But it's something I'll certainly give a try, this year.